Summer is upon us and it’s the perfect time to get outside and move. Relay races for kids is a fun way to do this! 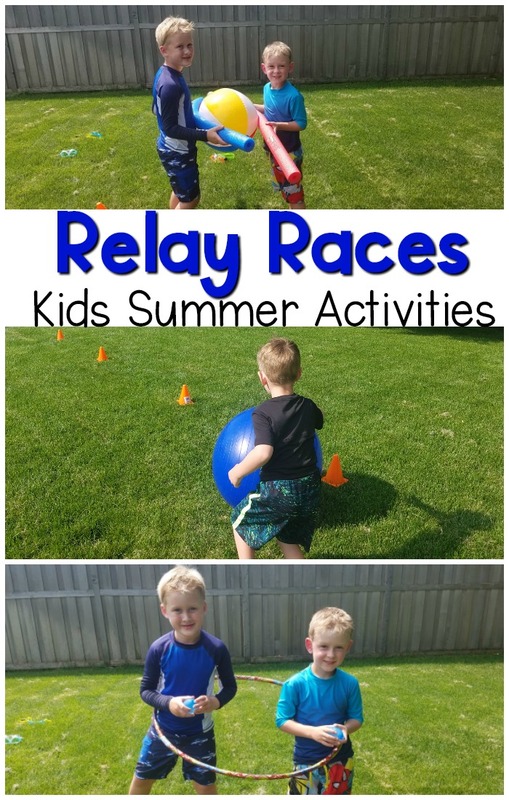 Whether you are looking for activities for your own kids, a family get together, camp, or summer school you need to check out these kids relay games! The relay games promote physical activity and teamwork. I love the fact that you can race against each other or time your kids so that they race against themselves! Dig out your exercise ball and set up cones in a straight line. Make sure their is a large enough area that the ball can roll between the cones. It’s fun to race against a friend or try timing the kids to see if they can improve. My own preschooler loves to race to see if he can beat his own time! This race works on coordination and team work. This relay race consists of partners holding a pool noodle with a beach ball in between the pool noodles. Players race from the start to the finish trying not to let the beach ball fall to the ground. This relay race for kids works on grading force to keep water balloons under the arm pits. It also requires the coordination to move your body as quickly as you can without the water balloons breaking. Rules can vary for this race. If the water balloon(s) break you can require the kid to run back and get a new water balloon. Another option can be keeping track of points. This would be done by tracking how many water balloons the child can bring to the basket in a given number of time. This relay also requires partners. The goal is to run from the start to the finish without letting the hula hoop drop to the ground. If the hula hoop drops the partners must pick it up before continuing to run. Add a little fun by carrying a water balloon. Race against friends, race against time, or race for points (see how many water balloons in a certain amount of time).